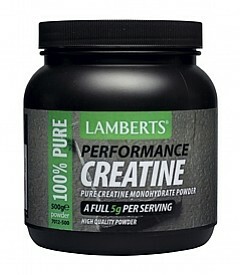 Pure Creatine Monohydrate for mixing in to drinks and shakes. Creatine is one of the most widely used sports supplements and there is now official recognition, based on many studies carried out on this fascinating material, that it plays an important role in building muscle. Of course it will only do this if it is included as part of a training regime designed to build muscle! Other studies indicate that for some people, creatine may help to delay muscle fatigue. Creatine is concentrated in muscle tissue including the heart, where it's involved in the production of ATP, the source of energy that powers muscle contraction. Our bodies can make creatine, and we also obtain it from eating meat and fish. Creatine supplements are useful for providing a big dose of creatine when our bodies need it most, and this powdered form is useful for stirring in to drinks and shakes. We use only the purest creatine monohydrate - so this product is guaranteed to be the same high quality as Creatine products costing twice as much. 5g although up to 20g can be taken initially. We recommend 5g per day mixed into drinks including protein shakes squash or fruit juice. High intakes can be taken as a ‘loading dose’; 4 servings of 5g taken throughout the day for 5 days. Allergen advice: Produced in a factory that uses: wheat, eggs, peanuts, nuts and gluten containing ingredients. Cautions: Do not take if pregnant or breast feeding. Storage instructions To be stored in a cool dry place and protected from light.